A symphony concert. A statue. These artworks of sculpture and music are charged with meaning in the context of war commemorations in Sarajevo today. The music is Haydn’s “God save the Emperor” and the statue is a monument to the assassin who killed the emperor’s heir. If you know anything about the outbreak of the First World War, you might feel a chilly shiver. The tensions live on. 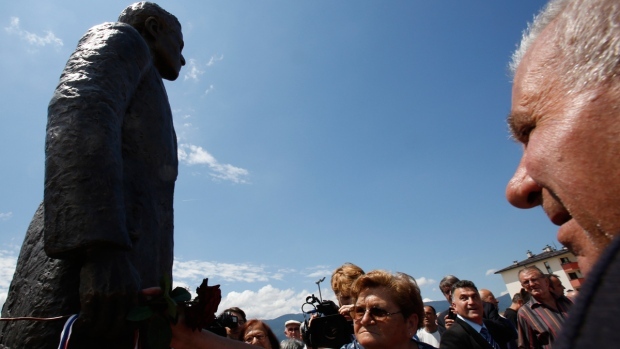 Sarajevo divided in First World War commemorations. Knowledge questions for TOK: To what extent does history give us knowledge of the past, and to what extent does it give knowledge of the present? OR To know the meaning of a work of art, is it necessary to know its social or historical context? Rang in the centenary of WWI with a vigorous argument about its origins and long shadow with my American husband. His view of European history is entirely colored by WWII and the lived history of his dad and others of the “greatest generation”, as they are called here. Meanwhile I had to dredge up my knowledge of 19th century history to provide a crash course – for which art, music and poetry provide important memory markers. That said, I’m glad I don’t have to write a TOK essay about it. Thanks for your comment, Astrid. World War II certainly takes the stage away from World War I in popular American movies — perhaps because it’s within living memory, but perhaps also because the Nazis, and opposition to them, provide some gripping issues, whose familiarity makes them more easily filmed. WWI, in contrast, is remote and messy. Still, there have been some excellent documentaries for the anniversary of the start of WWI in circulation in Canada this past year…though the best that Theo and I have seen was done by the BBC. Like you, I find literature affects my memory of historical events — and sometimes even creates the version that I recall, with the story unconstrained by facts. And for WWI, I suppose I think immediately of the British war poets.